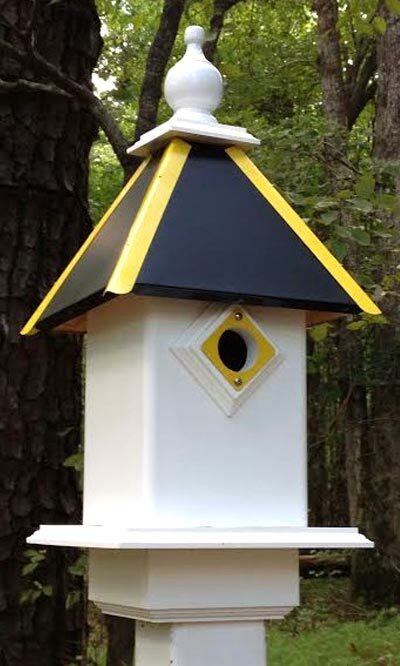 Showcase your favorite team in your backyard using the Wing and a Prayer Team Colors Bird House with Black Roof and Gold Accents. This fantastic, durable shelter provides small songbirds a wonderful roosting spot, and its all white body lends a classic hint to the piece. The black, painted metal roof captures attention, while its gold colored tines and predator guard clearly display your support of your favorite hockey or football team. Crafted from durable, square PVC tubing, this home offers plenty of room for a woodpecker, bluebird, or chickadee family, and the modern construction will retain its integrity year after year without delaminating, rotting, or mildewing. A 1.5" diameter entry hole rests on the front of this house, and PVC trimboard surrounds it for depth. This trim acts as a predator guard, preventing raccoons from reaching into the nest, and a gold piece of metal atop the guard keeps squirrels and woodpeckers from enlarging the hole. The roost remains protected with the generous, black metal roof, and the gold colored tines enhance the theme. A white, wooden finial tops the shelter, and this can be removed for quick nest checks. It also allows the roost to remain ventilated for nestling safety. Wooden blocks keep the floor in place at the base of the home, and elevate the nest from the floor to protect it from captured water and parasites. An extended platform around the base of the structure creates places for songbirds to land, and the attached collar allows you to display the shelter on a true 4" x 4" post (not included). Blend your bird watching and sport watching hobbies with this Team Colors Bird House with Black Roof and Gold Accents. Made in the USA.